SERESTO®contains imidacloprid and flumethrin. This is released slowly and continuously in low doses by the polymer matrix system of the collar onto your pet's skin and coat, where it forms a protective layer, repelling ticks and fleas. 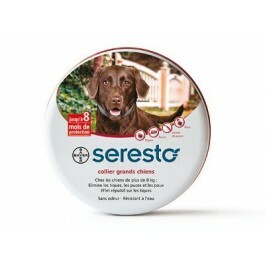 The SERESTO®COLLAR can be used for the prevention and treatment of fleas and ticks for up to 8 months. 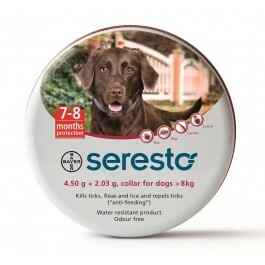 SERESTO® is only available with a prescription from your veterinary surgeon. SERESTO® contains Imidacloprid and Flumethrin. Imidacloprid is an ectoparasiticide belonging to the chloronicotinyl group of compounds. Chemically, it can be classified as a chloronicotinyl nitroguanidine. Imidacloprid is active against larval flea stages, adult fleas and lice. In dogs, efficacy against fleas (Ctenocephalides felis and Ctenocephalides canis) starts within 48 hours after application of the collar. In addition to the indications listed under the 'Uses' section, an activity against Pulex irritans fleas has been demonstrated. In addition to the indications listed under ‘Uses’ section, activity has been demonstrated in dogs against I. hexagonus, I. scapularis and the non-European tick species Dermacentor variabilis and the Australian paralysis tick I. holocyclus. The product provides repellent (anti-feeding) activity against the claimed ticks, thus preventing repelled parasites from taking a blood meal and thereby indirectly aids in the reduction of the risk of Vector-Borne Disease transmission. In dogs, in addition to the pathogens listed under 'Uses' section, indirect protection against the transmission of Babesia canis canis (by Dermacentor reticulatus ticks) has been shown in one laboratory study at day 28 after treatment, and indirect protection against the transmission of Anaplasma phagocytophilum (by Ixodes ricinus ticks) has been shown in one laboratory study at 2 months after treatment, thereby reducing the risk of diseases caused by these pathogens under the conditions of these studies. Data from efficacy studies against sand flies (Phlebotomus perniciosus) showed a variable sand fly repellent (anti-feeding) efficacy ranging from 65 to 89% for 7-8 months following initial application of the collar. Data from 3 clinical field studies performed in endemic areas indicate a significant reduction in the risk of Leishmania infantumtransmission by sand flies in treated dogs compared to non-treated dogs. Depending on the infection pressure by sand flies the efficacy in the reduction of the risk of infection with leishmaniosis ranged from 88.3 to 100%. Both active ingredients are slowly and continuously released in low concentrations from the polymer matrix system of the collar towards the animal. Both actives are present in the cat’s or dog’s haircoat in acaricidal/insecticidal concentrations during the entire efficacy period. The active substances spread from the site of direct contact over the entire skin surface. Target animal overdose and serum kinetic studies have established that imidacloprid reached the systemic circulation transiently while flumethrin was mostly not measurable. Oral absorption of both active substances is not relevant for the clinical efficacy. One 70cm collar in a recyclable tin container. 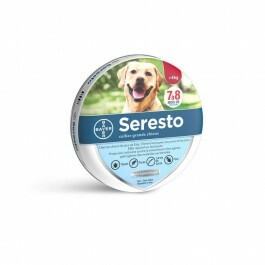 SERESTO is a prescription product and must be applied according to the instructions of your veterinary surgeon. Please read theproduct leafletthoroughly before applying to your pet. More information about this medicine for the public can beviewed here.